Karen Charles, Artistic and Executive Director of Threads Dance Project in Minnesota was in the middle of her panel discussion (“Reclaiming My Space: Black Female Bodies on the Main Stage”) at the International Association of Blacks in Dance Conference when she made that statement. She was speaking about her father who had spent his life as a postal worker, though he was actually passionate about something else that he never took the time to delve into. I was sitting in the room—surrounded by fellow dancers, dance educators, dance administrators, lovers of the arts—hearing those words and thinking: “Yup. This is where I’m supposed to be.” It made me think back to my own journey to becoming a Rockette. I made the decision to audition for the Rockettes rather late in my dance career. I’d always viewed it as one of those unattainable dreams. Would it be amazing to do? Absolutely! Could I do it? Probably not? Should I even try? Nah. I had convinced myself it wasn’t within my reach; it wasn’t for me. Then, in December of 2015, I finally saw the Christmas Spectacular live at Radio City Music Hall. The show was truly spectacular—the visuals, the dancing, the story—but it was seeing a Rockette who looked like me, performing up there on the Great Stage, that had the most impact. It’s true what they say: representation matters. I guess I didn’t realize just how much it did until I saw a woman of color doing the very thing I thought wasn’t for me. Auditioning to be a Radio City Rockette didn’t have to be one of those things I always wanted to do, but never did. I was immediately inspired to go for it! Fast forward to now and being able to attend the IABD conference with a few of my fellow Rockette sisters was amazing. I shared my story at our panel discussion (“Commercial Dance: The Radio City Rockettes and the Talent Pipeline”) and it was probably my favorite part! I thought, how many pairs of eyes staring back at me right now have had the same thoughts that I did before I decided to give the Rockettes a shot? Being able to tell these young, talented dancers of color with varying backgrounds that this is a possibility for them was truly a full-circle moment for me. 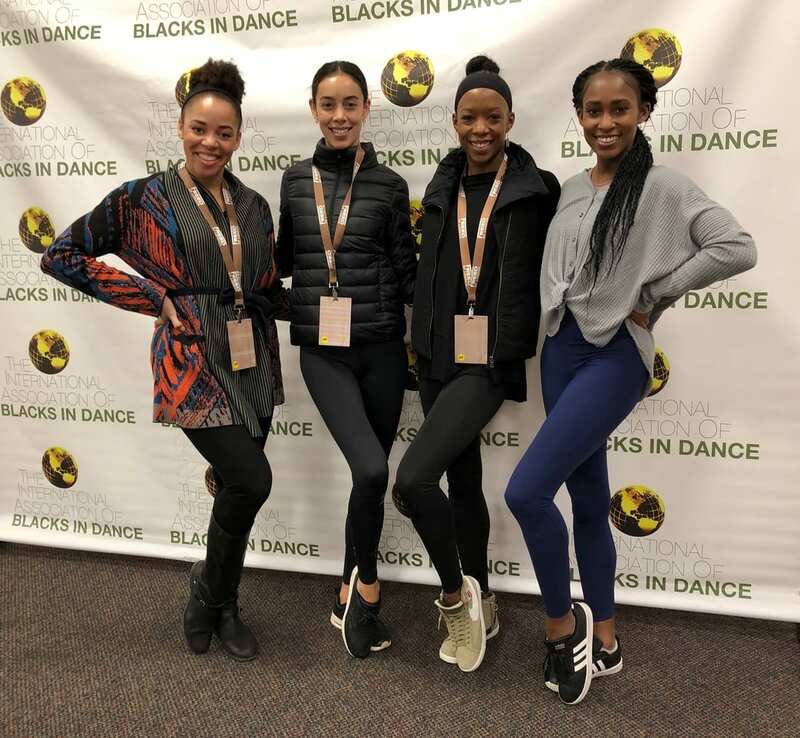 In addition to our panel, we had the opportunity to teach three master dance classes at the conference that not only showcased our precision-based style, but also highlighted our versatility as dancers and performers. Our goal was to expose these conference attendees and dancers to what we’re all about and show them what it’s really like to train like a Rockette. One dancer came up to us in our final class and told us that her time at IABD helped expand her respect for us and what we do; and, in that moment, we realized our goal had been accomplished. That is the beautiful thing about IABD, an organization that’s been around for over 30 years. They provide an avenue for young dancers of color to connect with past and present industry professionals from all over the world. Through master classes, workshops, panel discussions, performances, and meeting diverse icons from companies like Alvin Ailey, New York City Ballet, and now, the Radio City Rockettes, they are shown that they, too, have the opportunity to pursue a professional career in dance. This is huge and definitely something I wish I had been exposed to as a young dancer. To be able to share this experience with my fellow Rockettes, be part of this incredible Radio City legacy, and to share my story with other young dreamers was beyond special and something I will never forget.